Himalaya Spring 2018: Adrian Ballinger Goes for Cho Oyu-Everest Double Header. 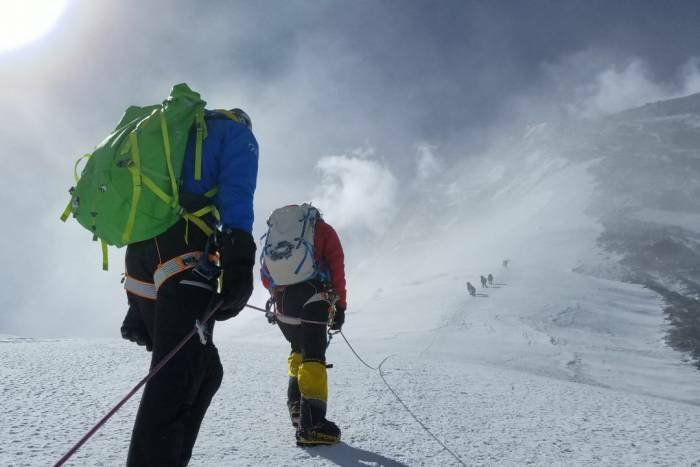 It continues to be an interesting and busy spring season in the Himalaya, where teams are now steadily filing in to Base Camp on both sides of Mt. Everest as they begin the long process of acclimatization. As reported last week, the Icefall Doctors have completed the route through the Khumbu Icefall on the South Side, and the way is now clear for teams to go all the way up to Camp 2. Meanwhile, on the North Side, the teams are getting settled and shuttling gear to Advanced Base Camp further up the mountain. Typically it takes a few days for most of the teams to get settled into place and a rest is often in order prior to beginning the actual climb. The first few days in BC are often spent polishing climbing skills and taking short hikes around the area, before setting a schedule to move further up the mountain. On the Nepali side of Everest, a number of teams will make their first acclimation rotation on another nearby peak, thus limiting the number of times the teams have to pass through Khumbu Icefall. Ahead of the start of true climbing operations on Everest comes some interesting news of things we can expect in the days and weeks ahead this year. For example, I conducted an interview with Alpenglow owner and head guide Adrian Ballinger last week that was posted over at Gear Junkie. In that interview, Ballinger talked about a wide array of topics, but especially his plans for this season. Adrian will lead a team of climbers on a potential Himalayan double-header, making rapid ascents of both Cho Oyu and Everest. To do this, he and the other members of the team have been acclimating prior to leaving for Tibet by using oxygen tents back home, a process that has proven to be very successful in recent years. Beyond that, Ballinger also told me that he would be climbing with bottled oxygen this year. The past two seasons he concentrated on getting a no-O’s summit of Everest, making that dream a reality in 2017. But, he says that he didn’t enjoy those climbs and remembers very little of the expeditions on the top third of the mountain. This year, it will be like discovering the route all over again. In the interview, he also shares his thoughts on low cost operators, the evolving environment on Everest, and much, much more. It is definitely worth a read and you can check it out here. Ballinger isn’t the only one going for two summits this season, as two other squads are looking to complete an Everest-Lhotse traverse. The first of those will be attempted by Tenjing Sherpa, who wants to complete that expedition in memory of his climbing partner Ueli Steck, who perished in the Himalaya while preparing for that climb last year. The duo of Horia Colibasanu and Peter Hamor are also looking to make the same climb. Meanwhile, Willie Benegas and Matt Moniz will also attempt an Everest-Lhotse double-summit, but not the traverse. There will be plenty of other good stories to follow in the days ahead, including some interesting climbs taking place on other peaks throughout the region. For now though, most of the teams are just finding their place and haven’t even truly begun their expeditions yet. Stay tuned for more updates in the days ahead.